A team of international astronomers has found the smallest star known in our galaxy. The star — which only has the scientific designation of EBLM J0555-57Ab — is located about 600 light-years from Earth and can be seen from the Southern Hemisphere — if you look through a large telescope. "I was a little surprised to find one this small," Amaury Triaud, co-author of the paper published in the journal Astronomy & Astrophysics on Wednesday, told CBC News. Astronomers searching for exoplanets, which orbit other stars, came across the star in one of their surveys. 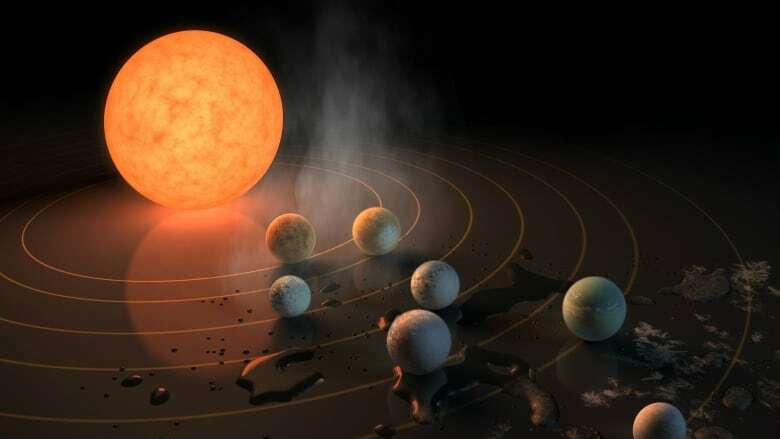 This is part of the team that discovered the TRAPPIST-1 system, another small and dim star that has seven planets, three of which hold the best chance for finding life outside our solar system, something that Triaud, who is a senior researcher at the University of Cambridge's Institute of Astronomy, still believes to be true. The team focuses mainly on exoplanets, using the Wide Angle Search for Planets (WASP) survey, telescopes that look for minute dips in a star's brightness that may indicate a planet is crossing in front of it. But sometimes stars pass in front of another star as part of a two-star system. Astronomers have catalogued 200 of these binary systems using WASP. Initially, the astronomers thought that it was an exoplanet. The star is 2,000 to 3,000 times fainter than our own sun. However, upon collecting more data, they realized that the mass indicated it had to be a tiny, dim star. Astrophysicists believe that starting fusion — where gravity creates high pressure and temperatures that change hydrogen atoms into helium atoms — can only be done at a particular mass. And this new star is massive enough to do that. 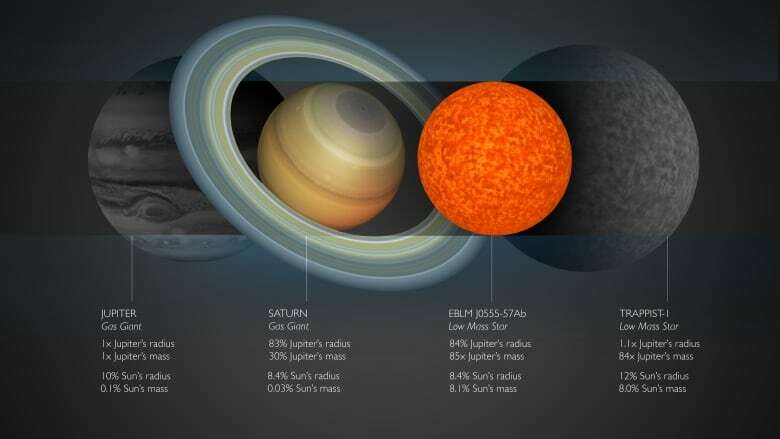 The small star is just slightly larger than Saturn, or 80 per cent the size of Jupiter, with a radius of 49,000 kilometres. It also has 85 times the mass of Jupiter: if you could stand on the star, the gravity would be 300 times Earth's. When there are two stars in a system, they orbit around the same spot, called the barycentre. And this newly discovered baby star is so close to its companion — 10 times closer than Mercury is to our sun — that it takes just seven days to orbit the shared barycentre. 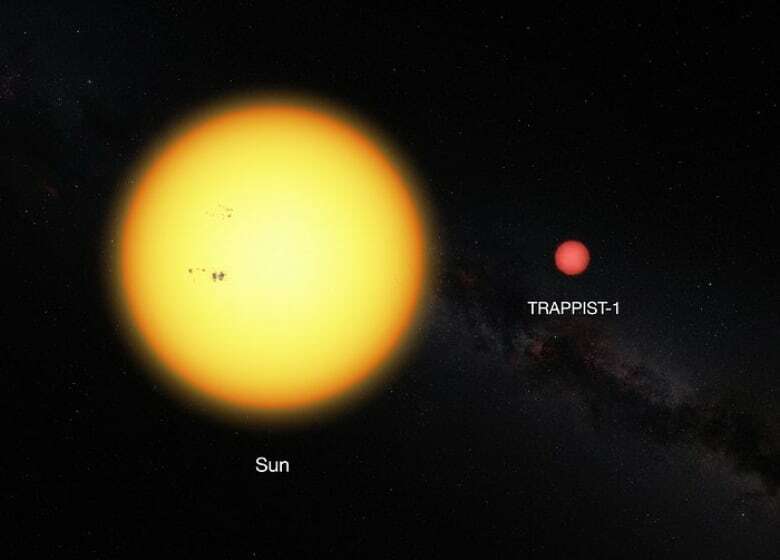 In a typical binary system, there is a separation between two stars that is larger than our solar system, Triaud said, somewhere between 100 and 1,000 astronomical units (one astronomical unit is the distance between Earth and the sun, about 150 million kilometres). In this case, Triaud noted, it's only eight per cent of an astronomical unit. The star is not only small, it's much cooler than many of the gas giant exoplanets that have been discovered. "That star likely represents the smallest natural fusion reactor that we know of," Triaud said. "We're trying to replicate fusion on Earth in labs, but that's basically as small as it gets in nature." The mass of this star is much like TRAPPIST-1, but it is 30 per cent smaller. The astronomers will continue to study the star, where among other things, they will attempt to determine how much light the star emits. It's somewhat difficult to study this dwarf star due to the companion star's brightness. "It's like trying to look at a candle beside a lighthouse," Triaud said. The team hopes this will shed some light on some of the most abundant stars in our universe. "It shows how many different objects exist in the universe," Triaud said. "Most of the stars have the mass less one-quarter that of the sun … although it's a bit on the smaller range, but it's part of the smallest stars that exist, which are the most common stars that exist. And it's odd that we know so little about the most common stars in the universe."